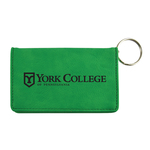 A wide selection of York College of Pennsylvania Gifts. Click action pen with gel ink and York College imprint. Double ring snap key ring with YCP imprinted. 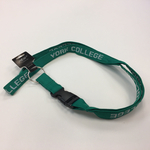 Leather key tag with metal interior and York College of Pennsylvania logo on metal. LXG pewter present ornament with YC Spartan logo on sides. 3" 3-dimensional metal die cast design pewter holiday ornament featuring Spartan between YC. 3" 3-dimensional metal die cast design pewter holiday ornament. LXG features clasp closure and key chain attachment. Size: 4 3/8" x 3"
2" Mandela pattern York College sticker. 33 ft. Bluetooth signal distance, can use function keys to change brightness, volume, eject, play/pause, with Mac use only. 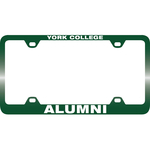 2" Marble pattern York College sticker. Plus teddy bear wearing a green York College Sweatshirt. Show off your Spartan Spirit every day on your way to work, the gym, or around town with an Alumni license plate frame. MCM Aromatic 12" Stuffed bear features a York College Tee and a pleasant aromatic scent of Lavender, Jasmine, Vanilla, or Cinnamon. 12" stuffed Dexter bear with "Somebody at York College loves me!" removable T-shirt. 12" stuffed dexter bear with a "Somebody at York College loves me!" removable Pink T-shirt. Dog bandana with Paw prints and Spartan between YC. Show the world you are a Spartan with a YCP Spartan license plate frame!